Orange Jordan signed an agreement with the Abdali Medical Center (Abdali Clemenceau Hospital), which is expected to start operating in the second half of 2019 in Al-Abdali area. According to the agreement, Orange Jordan will provide the center with fixed and Information and Communications Technology (ICT) services, including: landlines, internet, electronic security, audio and video systems, wired and wireless networks, as well as data center services. 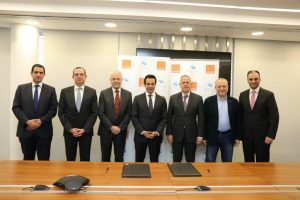 The agreement was signed by CEO of Orange Jordan, Thierry Marigny, and CEO of Abdali Medical Center, Ahmad Abu Ghazaleh, in the attendance of Chief Enterprise Officer of the Business Unit, Eng. Sami Smeirat, Chief Operations Director, Edward Lutz, and Chief Security Officer, Paul Casterton in Abdali Medical Center. On this occasion, Marigny said: “We are very pleased to partner with Abdali Medical Center, as it will become one of the largest and most important medical centers in the Middle East, providing exceptional medical services through the latest and state-of-the-art technology in this field. Through this partnership, we seek to offer the center an exceptional experience,through providing fixed telecommunications and ICT services, to enhance its daily operations. Through our partnership with Abdali Medical Center, we also seek to contribute to creating a positive transformation in the quality of medical services offered to citizens”. From his side, Abu Ghazaleh said: “We seek to make this facility a medical tourism attraction in the region, by providing exceptional medical care services on a local, regional, and global level”. He said: “Our partnership with Orange Jordan stems from our vision to provide the best medical services to our patients, as this partnership will support us in achieving our main goal of alleviating the level of outstanding medical services to reach the highest levels in the world, using the latest technologies in this field, noting that Orange Jordan has been able to provide the latest ICT information systems required by the center at the best price”. Abu Ghazaleh stressed that in order to complement the royal vision, our investment in this distinguished medical facility will create approximately 1,200 jobs, which will have a great positive impact on the socio-economic sector in our beloved Jordan”. From his side, Eng. Smeirat said: “The trust given to us by the Abdali Medical Center management signifies our company’s leading position in the telecommunications and ICT sector, as we offer the best integrated telecommunications solutions to all organizations and companies from different sectors, stemming from our aim of creating a digital transformation in the region, through implementing the highest standards of network security and protection”. It is worth noting that this agreement is part of a series of agreements between Orange Jordan and several institutions and hospitals in the health sector in the Kingdom, through which the company aims to contribute to the development of the local ICT sector in all areas, touching the daily lives of citizens.